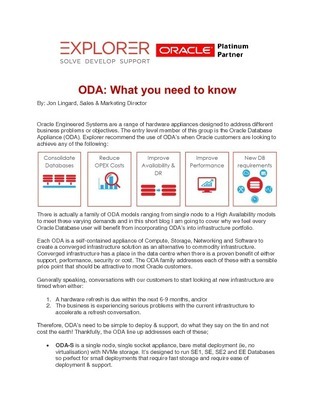 How much difference can converged infrastructure make to your oracle database? Typically, conversations about adopting a new infrastructure start when a hardware refresh cycle is due, or when the business is experiencing a serious problem with the existing infrastructure. For this second reason, the new platform needs to be simple to deploy and support, as well as fast and robust. Take for example this Oracle Database Appliance. Built as a self-contained compute, storage, and networking device. Read this asset and learn more about what this infrastructure provides.